Although MyInfo has no native versions for MacOS or Unix yet, it is still possible to run it on such systems. This is a quick guide how to install and use MyInfo under Mac (using Crossover) and under Linux (using Crossover or using WINE). Download the trial version of CrossOver and install it. Click “Install MyInfo Now” on the same page and install MyInfo following the instructions on the screen. After MyInfo is installed, try to launch it. If it starts without showing any error message, then this is everything you need to do and you can skip the rest of the instructions. 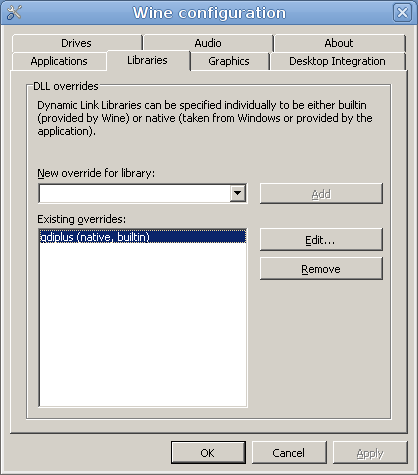 Either click the drop down box “New override for library” and find “gdiplus” in the list or type “gdiplus” in the text box. Installing MyInfo under Linux using CrossOver is the same as for Mac. Update: it does not work with MyInfo 6 or newer, because Mozilla Control is no longer updated and is way behind modern browsers in terms of security and web standards support. MyInfo internal web browser is a useful feature, which allows you to browse web addresses stored in MyInfo, without leaving the application. By default it uses Microsoft Internet Explorer engine to show web pages. Many people prefer Mozilla Firefox as their default browser, so since version 3 of MyInfo, we offer an option to use the same engine that Firefox utilizes to show web pages: Mozilla Gecko. Because this the distribution of this engine is not supported officially by the Mozilla Development Group, this is an experimental feature of MyInfo. It is not documented in the official help files and we offer no technical support for it. Download Mozilla Control Installer from our web site and install it. If you are not experienced working with Windows Registry, make a backup first. Run Windows Registry (you can do that by clicking Run command in the Start menu, typing “regedit” and clicking OK). Go to the “HKEY_CURRENT_USER\Software\Milenix\MyInfo\3\Options” registry key. Create a new DWORD Value with name “ShowMozillaOption” and value 1. Close Windows Registry and restart MyInfo. On the Tools menu, click Options and go to the Advanced tab. Check the newly available Use Mozilla As Internal Browser (experimental) option. Now when you open web document, MyInfo will use the Mozilla Firefox engine instead of the Internet Explorer engine! Please note that you need to install the Mozilla Control even if you have Firefox installed, because it is a separate software. It does not interfere with your current Firefox installation. People use MyInfo for a great variety of tasks: information storage, writing, project management, organizing roleplaying campaigns, and more. Recently, we discovered that MyInfo makes an excellent recipe organizing tool. There are some specialized recipe organizer applications out there, which are better if you need calorie counting and other dieting features. Otherwise, MyInfo has all what you need in a recipe organizer and offers you the freedom not available in the other tools. You already know how easy to use is MyInfo as information manager. As a recipe organizer it is also so easy and intuitive to use. We have included even cooking templates (for a cookbook and for a recipe) to help you start organizing your recipes right away. You can see a sample cookbook for MyInfo by downloading the Open Source Cookbook in MyInfo format. If you are looking for recipe organizer, why not see all features that MyInfo offers as a recipe organizer?